EBCC Board Member. MassEnergy Viridian. I have been a member of East Boston Chamber of Commerce since 2012 because I saw the value of this wonderful organization connecting me with a wide range of businesses and other organizations. I was fortunate to join EBCC as board member in 2015 to contribute more and give back to the community. I am dedicated to our members’s growth and prosperity. I can help you grow businesses, connect you to leaders and legislators, and provide valuable saving on benefits and services. President & CEO of Casablanca Coach Worldwide since 1998, a worldwide chauffeured transportation company in 550 cities. Also, a leader in protective services providing secured cars to the most influential dignitaries in high risk countries. A Partner of Viridian International, a socially sustainable company in renewable energy, solar and zero carbon-travel. Viridian International is a simple choice supports initiatives that create lasting impact all over the world. 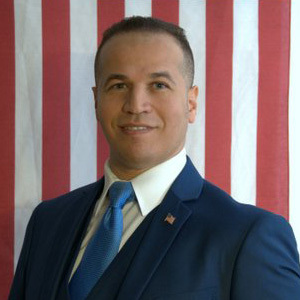 Alexander Rhalimi, has a Bachelor and a Master of Criminal Justice from Boston University. Also, certified in Law Enforcement and Legal Studies, and ran for Suffolk County Sheriff race in 2016. Currently, lives in Revere with his wife and two children.